You can make these pickles a few days (or even a few hours) before your guests arrive, and they keep in the fridge for a couple of weeks. Peel and slice the carrots (diagonally or crosswise, about 3/8" thick). Separate and peel the garlic cloves; keep them intact. Boil the carrots in lightly salted (1/4 tsp.) water for 3 minutes (using just enough water to cover), then drain. Combine the sugar, cumin seeds, peppercorns, 1/2 tsp. salt, vinegar, and 3/4 cup cold water in a bowl. 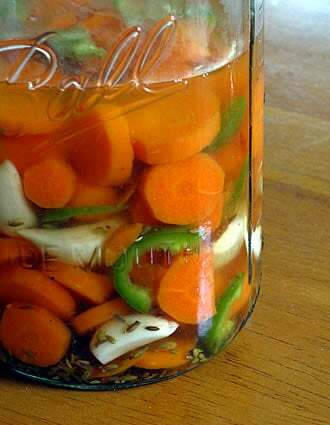 Stir to dissolve the salt and sugar, then add the carrots, garlic, and jalapeño. Refrigerate at least a few hours (preferably overnight) before serving in a bowl with toothpicks.